That deaf, dumb, and blind kid sure plays a mean pinball. — The Who, "Pinball Wizard"
Pinball is a type of Arcade Game where players score points by manipulating one or more steel balls on a playfield inside a glass-covered cabinet. Points are scored by striking certain targets and completing various objectives, and a player's turn ends when the ball drains off the bottom of the playfield. Skilled players can extend their playtime by keeping the ball in play as long as possible and earning extra balls; bumping, nudging, and slapping the table to affect the ball's behavior are legitimate gameplay techniques, but excessive force will invoke a TILT and cause the player to lose the current ball. Free games, called "Specials", can be earned either by very skilled playing or by random award at the end of a game. Thousands of pinball tables have been created in the lifetime of the genre. Most tables have a theme, often with a license of some kind. Although their popularity in arcades have been diminished by the rise of Video Games, pinball continues to live on, whether it's via Pinball Spinoffs of popular video games, digital emulation of Physical Pinball Tables, or original tables made for both commercial establishments and private collectors. Even today, fans continue to collect tables as a hobby, and a vintage table in excellent condition can cost tens of thousands of dollars. Truly devoted players have created their own games, either by retheming an existing pin or by building original tables from scratch. Though the game is believed to be based on ground billiards games, the original pre-pinball game is generally accepted to be bagatelle; invented in France in the 17th century, it was an indoor game where players would shoot balls with a stick from one end into score holes. Arcade Game vendors in the 19th and 20th centuries added pins, spring launchers, scoring troughs, and flashing lights to these "marble games". While it was not the first game of its type, David Gottlieb's Baffle Ball is considered the first commercially-successful "pin game". It was affordable for most drugstore and tavern owners to purchase, and quickly recouped its costs with people seeking cheap entertainment during The Great Depression. Other imitators quickly followed, with the term "pin ball" used to describe them after the release of Mill's 1932 Official game. Attempts by manufacturers to differentiate their games caused rapid evolution in the field, leading to elements like electric bumpers and flippers, which increased the amount of chance and level of player control to the game. The notion that pinball was entirely based on luck reached its peak in the middle of the 20th century, when the city of New York banned pinball on claims that they were a form of gambling that led to delinquency. note There was some truth to this; unsavory places offered rewards or cash prizes for high scores, and the Mafia ran some pinball arcades, just as they did to other businesses. 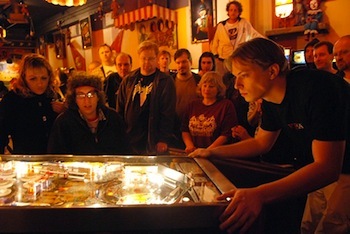 Although most establishments skirted the lawsnote It was legal to own pinball machines for personal use or ignored the bans, it remained on the books for over thirty years; it ended in 1976 when writer Roger Sharpe testified before a committee that pinball was not a game of chance, but required skill and finesse. Sharpe demonstrated this with a courtroom pinball game, capped when he announced that he would launch his next ball through the center lane at the top of the playfield, then proceeded to do so. The committee immediately removed the ban, though Sharpe later admits his courtroom success was by sheer luck. Although pinball got started with purely mechanical "pin games" like Baffle Ball, the earliest age of pinball is considered to be the Electro-Mechanical (EM) Era. Starting with Contact, these were games driven by electrical mechanisms. Since there were no computer processors running these games, nearly all EM games required that every point, light, and rule change to be controlled by a complex array of relays and switches all working in perfect order. Sound effects consisted of chimes of varying tones, accompanied by the clacking of solenoids. Play style on these machines is fast and frantic, with short ball times and a lot of emphasis on careful aim and good nudging skills; many EM machines give a default five balls per play to compensate for the quick speed. Pinball entered the computer age with the introduction of solid-state (SS) controllers, with the first games being Spirit of 76 (MicroGames) and Hot Tip (Williams Electronics). The earliest SS machines played very similar to their electro-mechanical brethren, but later games added more complex scoring rules, modes, and objectives, along with electronic sound effects, music, voices, and choreographed playfield light shows. To fend off competition from Video Games, pinball gameplay trended toward giving players more for their money, with longer ball times and more crowd-pleasing features such as ramps, multiball, and progressive jackpots. As play times tended to be longer, games would give only three balls per play. The addition of dot-matrix displays (DMDs) to pinball games (starting with Data East's Checkpoint) opened up more new possibilities to the field. Although internally similar to solid-state games, the DMD gave designers a new outlet for feedback and storytelling; the screen gave immediate information on important objectives, options could be selected on-screen, and animated clips and Video Modes add to the entertainment value. Gameplay on these tables is far less linear than previous generations, usually with only one or more Wizard Modes acting as a final goal. Ball times are even longer than before, and a skilled player can go for twenty minutes at a time. Even recent games using LCD screens such as The Wizard of Oz and Full Throttle are considered part of the DMD era.